Research suggests that both life-time experience of reading fiction and the extent to which a reader feels ‘transported’ by the narrative are associated with empathy. This study examined these relationships further by delineating empathy into cognitive and affective components. Thirty-three participants were tested on prior exposure to fiction, transportation, and different measures of cognitive empathy, affective empathy and helping tendency. The results revealed that exposure to fiction was associated with trait cognitive, but not affective, empathy, while the experience of being transported was associated with story-induced affective empathy. Story-induced affective empathy was also associated with helping tendency. The results are discussed by considering implications for relationships between reactions to fictional worlds and reactions to real-world behaviours. Keywords: cognitive empathy , affective empathy , reading fiction , transportation , helping behaviour. Reading fiction can be a deeply absorbing experience. Readers commonly refer to the experience of being lost in a book (Nell, 1988), or being transported to a different world (Gerrig, 1993). However, relatively little attention has been paid to the mental processes associated with reading fiction, and how they relate to thoughts and behaviours in the real world. The current study examined the relationships among different aspects of fiction reading, i.e. life-time exposure to fictional stories and the immediate experience of being transported by a story, and two components of empathy: cognitive and affective. Cognitive empathy is the ability to understand the world from another person’s point of view and to infer beliefs and intentions, whereas affective empathy refers to the capacity to share another’s feelings and emotions (Blair, 2005). Much of fiction is concerned with protagonists’ understandings and misunderstandings of the beliefs and motives of other characters and is only comprehensible if the reader is exercising cognitive empathy (Lodge, 2002; Zunshine, 2007). Affective empathy has also been proposed as an essential component of the understanding and enjoyment of fiction (Hogan, 2010). Indeed, Hogan (2010) has argued that literary representations of emotion may be ‘purer’ than those encountered in real-life, and thus have the power to enhance individuals’ affective empathic responses. In addition to the cognitive and affective empathy that is continuously exercised in ‘real-world’ social situations, it has been suggested that a separate component of empathy underlies the tendency to be transported by fictional stories and identify with their characters (Davis, 1980). An interesting question therefore arises as to the relationships between real-world practices of cognitive and affective empathy, and the ability to be transported by reading fiction. Reading fictional stories has been found to be associated with the development of empathy in children, suggesting that there is an important link between the empathy felt for fictional characters and the ability to empathise with people in reality (Adrian, Clemente, Villaneuva & Rieffe, 2005; Aram & Aviram, 2009; Mar, Tackett & Moore, 2010). Harris (2000) has suggested that there is continuity between children’s and adults’ engagement with fictional and real worlds. However, relatively few studies have examined the relationship between reading fiction and expressions of real-world empathy in adults. In two studies by Mar and colleagues, college students were tested on lifetime prior exposure to fictional texts and measures of empathy. Mar, Oatley, Hirsh, dela Paz and Peterson (2006) found that the amount of fiction students had previously read predicted performance on a measure of empathy requiring participants to infer mental states from photographs of people’s eyes (the ‘Reading the Mind in the Eyes’ [RME] test; Baron-Cohen, Wheelwright, Hill, Raste & Plumb, 2001). The correlational design of this study meant that inferences could not be drawn in relation to the causal link between exposure to fiction and performance on the empathy related task. Thus, it is, as of yet, unclear as to whether fiction-reading was the cause of greater empathic ability, whether people high in empathy are more drawn to read fiction, or whether there was an alternative unidentified variable that explained the association. One alternative explanation, that individual differences in personality were causally related to both exposure to fiction and empathy, was eliminated by Mar, Oatley and Peterson (2009). They found a positive relationship between exposure to fiction and ‘Reading the Mind in the Eyes’ despite controlling for the Big 5 personality variable of ‘openness to experience’. Mar et al. (2006) did find a measure of social ability that was negatively associated with exposure to fiction: the Interpersonal Perception Task -15 (IPT-15; Costanzo & Archer, 1989). This task measures the ability to decode social relationships represented in video clips using non-verbal cues, and was found by Costanzo and Archer (1989) to be highly correlated with peer ratings of social skills. These results suggest that there may be a more complex relationship between reading fiction and empathy. One possibility is that reading fiction has a stronger relationship with cognitive empathy, than with affective empathy. According to Lodge (2002), a characteristic of literary fiction is that it is able to provide detailed moment-by-moment descriptions of the inner thoughts and feelings of its protagonists, thereby providing rich opportunities for readers to experience cognitive empathy. In contrast, other fictional forms such as plays and films can offer representations of the external behaviours of their characters, but are less suited to the representation of internal thoughts and feelings. Based on the findings of their research study, Mar and colleagues (2006) suggested that an association between fiction-reading and cognitive empathy might explain why the RME measure positively correlated with exposure to fiction. They argued that the RME test is a measure of cognitive empathy insofar as it relies on matching a verbal descriptor to a depiction of a mental state, but does not necessarily require the participant to share the emotion concerned. The IPT-15, however, is more concerned with decoding embodied emotional cues and might therefore be taken as a measure of affective empathy, thus explaining why it was not associated with prior exposure to fiction. Thus, an aim of the present study was to test the hypothesis that prior exposure to the reading of fiction is positively associated with cognitive empathy abilities but not with affective empathy. While the Mar et al. studies considered the relationships between prior exposure to fiction and empathy, other studies have examined empathic responses to specific fictional texts. One variable that has been found to affect the relationship between fiction-reading and empathy is termed ‘transportation’ (Johnson, 2012). Using Green and Brock’s (2000) Transportation Index (which measures the extent to which a reader has been absorbed by a story’s characters, plot and imagery) and the Affective Empathy Index (Batson, Early & Salvarani, 1997), Johnson (2012) found a positive relationship between affective empathy and transportation in college students. That is, participants who reported being absorbed in a story also subsequently reported higher levels of emotions that have been associated with affective empathy, such as warmth, compassion and sympathy. Furthermore, there was a positive relationship between the level of affective empathy and performance in a subsequent ‘real-world’ helping task in which participants were presented with an opportunity to help pick up some pens that had been ‘accidentally’ dropped by the researcher. This study was also correlational in design, meaning that no inferences could be drawn about a causal link between transportation and affective empathy. However, immediately prior to reading the story, baseline measures of trait tendencies to be transported by fiction and to feel affective empathy were taken. By controlling for these, Johnson was able to strongly suggest that there may be a direct link between reading-induced experiences of affective empathy and helping behaviour, unaccounted for by an underlying tendency to be easily transported or experience affective empathy. In addition to this, Bal and Veltkamp (2013) found that participants who were assigned to read a fictional story showed increased levels of affective empathy, but only when highly transported. Participants assigned to read a piece of non-fiction showed no increase in empathy. Both the Johnson (2012) and Bal and Veltkamp (2013) studies found associations between transportation and affective empathy, but did not specifically test for a relationship between transportation and cognitive empathy. Thus, an additional aim of the current study was to test for associations between transportation and both cognitive and affective empathy. Considering the previous studies, it may be overly simplistic to propose a single relationship between reading fiction and empathy. Individual differences in reading fiction can be examined in relation to how much someone has read over their life-time, and also how transported they have been by a particular story. Furthermore, individual differences in empathy can be assessed in relation to both cognitive and affective empathy. The present study was thus designed to explore individual differences in life-time exposure to reading fiction, transportation, and cognitive and affective empathy. In line with Mar et al. (2006, 2009) it was hypothesised that exposure to fiction would positively relate to cognitive empathy but not necessarily to affective empathy. Conversely, in line with Johnson (2012) and Bal and Veltkamp (2013) it was predicted that transportation by a piece of fiction would relate to levels of affective empathy and subsequent helping tendencies, but not necessarily to exposure to fiction or cognitive empathy. Participants were students and staff from Oxford Brookes University in the UK who volunteered in response to posters displayed on campus. No incentive was offered for participation. A total of 22 women and 11 men participated, with a mean age of 29.5 years (range = 18 - 59 years, SD = 12.2 years). All participants spoke fluent English. Participants completed a number of questionnaire measures administered before and after reading a short fictional story. The fictional story was “Motholeli’s Story”, an extract from the novel “Morality for Beautiful Girls” by Alexander McCall Smith (2001). The extract was 1503 words long and was a self-contained episode concerning the experiences of an orphaned girl in Botswana. The story had previously been found to evoke emotional responses (such as sympathy and compassion) when used in a classroom exercise (Keen, 2007). Exposure to Fiction. The Author Recognition Test (ART; Mar et al., 2006) uses ability to identify the names of authors as an indirect measure of how much someone reads, and has been found to be a reliable and valid indicator of individual differences in exposure to print (Stanovich & West, 1989). The ART comprised 140 names, of which 50 were published fiction authors, 50 were published non-fiction authors, and 40 were decoys who were not published authors and thus, were not well known. Exposure to Fiction was measured by allocating one point for each correctly-identified fiction author, with Exposure to Non-fiction also being measured by allocating one point for each correctly identified non-fiction author. The inclusion of decoys meant that it was possible to detect participants who used a guessing strategy. The internal reliability of both measures for this sample was good (Exposure to Fiction, α = .951; Exposure to Non-fiction, α = .855). Trait Empathy. A baseline measure of trait empathy was assessed using three subscales of the Interpersonal Reactivity Index (IRI; Davis, 1980). The IRI is an individual difference measure of empathy, with sub-scales that encompass separate aspects of the overarching concept of empathy. The first sub-scale, Fantasy (F), measured the underlying tendency to identify with fictional characters, for example, “I really get involved with the feelings of a character in a novel”. Internal reliability for this subscale was good (α = .876). The second subscale, Empathic Concern (EC), measured the underlying inclination to feel affective empathy, such as, for example, “I often have tender, concerned feelings about people less fortunate than me”. Reported internal reliability for this subscale was low, (α = .503) given previous, higher reports by Davis (1980). Further analysis was undertaken to determine whether eliminating one or more items from the scale would result in improved reliability. No item combinations resulted in an alpha level greater than 0.6, however, and therefore it was decided to continue to use the original, well-validated, Empathic Concern subscale. The third subscale, Perspective-Taking (PT), measured the underlying propensity to exercise cognitive empathy, for example, “I try to look at everybody’s side of a disagreement before I make a decision”. It reported internal reliability approaching acceptability (α = .664). Each subscale consisted of seven items and participants indicated how well each item described them on a five point scale from “does not describe me well” to “describes me extremely well”. Story-induced Transportation. Transportation by the fictional story was measured by Green and Brock’s (2000) Transportation Index, which measures the extent to which a reader has been engaged by a story’s characters, plot and imagery. Items include content such as “I was mentally involved in the narrative while reading it”. Internal reliability for this sample was good, α = .835. The scale included 15 items and participants indicated how well each item described their experience of reading the story on a five point scale from “does not describe my experience well” to “describes my experience extremely well”. Story-induced Affective Empathy. The Affective Empathy Index (Batson, Early & Salvarani, 1997) was given to participants after they read the story to examine the amount of affective empathy experienced while reading. Affective empathy in response to Motholeli’s story was measured by asking participants to state on a 5-point scale (1 = “very little or not at all”, 5 = “extremely”), to what extent they had experienced feeling sympathetic, compassionate, soft-hearted, warm, tender and moved while reading the story. These items were distributed among a list of 20 additional emotional words (such as enthusiastic, nervous, attentive) serving as decoys. Internal reliability for this sample was good, α = .852. Story-induced Cognitive Empathy. Following the suggestion of Mar et al. (2006), the ‘Reading the Mind in the Eyes’ test (RME; Baron-Cohen et al., 2001) was given to participants after they read the story. This test required participants to choose one word from four candidates that best described the state of mind of a person depicted by a grayscale photograph of his/her eyes. There were 36 items in total and only one correct response for each. A glossary was provided so that participants could check the definition of candidate words if required. Internal reliability for this sample approached acceptability, α = .667. Helping Tendencies. As a measure of real-world helping tendencies, participants were asked to complete a short questionnaire designed by the researcher. Participants were told that, although Motholeli is a fictional character, there are over 2.5 million real orphans in South Africa alone. They were then asked to tick a box to indicate “I would like/prefer not to receive further information”. Participants were provided with an envelope in which to place their response so that it was not immediately visible to the researcher, thus providing some mitigation against pressure to make a socially desirable response. Participants were tested individually in a small room on campus. First, they completed the Exposure to Fiction questionnaire and the Trait Empathy measures. Following this, they read Motholeli’s story. After, they completed the Transportation Index, the Affective Empathy Index, the RME test, and finally the Helping Tendencies questionnaire. The procedure lasted approximately 30 minutes in total. Figure 1 summarises the tasks and the sequence in which they were administered. The construct(s) measured by each task are shown in brackets and italicised. The scale variables Exposure to Fiction, Exposure to Non-fiction, Trait Empathy (Transportation, Affective and Cognitive), Story-induced Transportation, Story-induced Affective Empathy and Story-induced Cognitive Empathy were first tested for internal reliability. Raw and partial correlations were then calculated to explore relationships between variables. Multiple regression and logistic regression analyses were performed to determine the extent to which cognitive empathy, affective empathy and helping tendencies were predicted by exposure to fiction and transportation. These analyses were conducted after controlling for exposure to non-fiction and baseline tendencies to be transported by a story and to experience cognitive and affective empathy. Raw correlations were calculated to investigate relationships between the scale variables (see Table 1). As older participants might be expected to have higher exposure to fiction scores than younger participants, participants’ age in years was included in the correlation analysis. Raw correlations between the scale variables. Note: ** = p < 0.01, * = p < 0.05. Key to abbreviations: EF = exposure to fiction; ENF = exposure to non-fiction; SIT = story-induced transportation; SIAE = story-induced affective empathy; SICE = story-induced cognitive empathy; TT = trait transportation; TCE = trait cognitive empathy; TAE = trait affective empathy. As expected, a significant positive correlation was found between Story-induced Affective Empathy and Story-induced Transportation, r = 0.601, p < 0.01. Age was significantly positively correlated with both Exposure to Fiction and Exposure to Non-fiction. Exposure to Fiction and Exposure to Non-fiction were also highly positively correlated with each other, suggesting that these variables may relate to a general interest in reading rather than a specific interest in fiction/non-fiction per se. To control for these potential confounds, partial correlations were run for Exposure to Fiction and Exposure to Non-fiction controlling for Age, for Exposure to Fiction controlling for Exposure to Non-fiction and Age, and for Exposure to Non-fiction controlling for Exposure to Fiction and Age. The results of the partial correlations are shown in Table 2. No other significant raw correlations were found. There was no correlation between Exposure to Fiction and cognitive empathy performance as measured by the RME test, suggesting that for this sample Exposure to Fiction was not related to this particular measure of social ability. There was also no correlation between Story-induced Transportation and RME, suggesting that higher levels of transportation by the story did not induce subsequent higher performance in cognitive empathy. Partial correlations controlling for Age, Exposure to Fiction and Exposure to Non-fiction. Note: ** = p < 0.01. Key to abbreviations: EF = exposure to fiction; ENF = exposure to non-fiction; SIT = story-induced transportation; SIAE = story-induced affective empathy; SICE = story-induced cognitive empathy; TT = trait transportation; TCE = trait cognitive empathy; TAE = trait affective empathy. The partial correlations confirmed that Exposure to Fiction and Exposure to Non-fiction remained highly correlated after controlling for Age. They also revealed two further significant relationships. Exposure to Fiction was positively correlated with Trait Cognitive Empathy after controlling for Age and Exposure to Non-fiction, r = .464, df = 29, p = .009. Exposure to Non-fiction was negatively correlated with Trait Cognitive Empathy after controlling for Age and Exposure to Fiction, r = -.522, df = 29, p = .003. The partial correlations therefore indicated that individuals with high Exposure to Fiction scored high in Trait Cognitive Empathy, whereas individuals with high Exposure to Non-fiction scored low in Trait Cognitive Empathy. No further significant relationships were revealed by the partial correlations. There was no correlation between Exposure to Fiction and cognitive empathy as measured by the RME task. 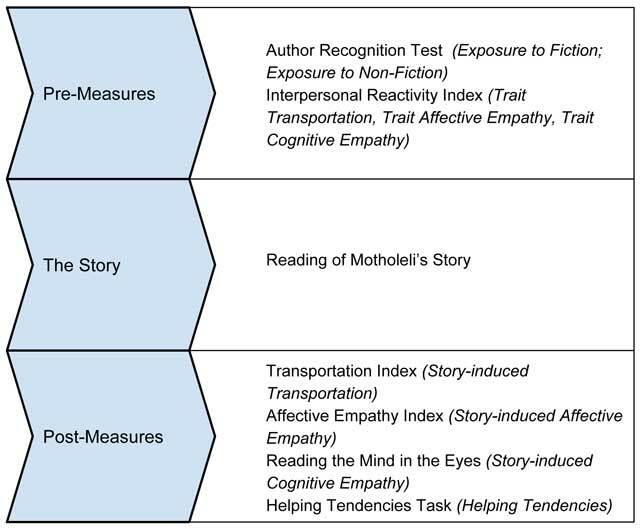 It was expected that Story-induced Cognitive Empathy (as measured by the RME test) would be predicted by Exposure to Fiction, and that Story-induced Affective Empathy would be predicted by Story-induced Transportation. Simultaneous regression analysis was therefore used to determine the unique contributions of Exposure to Fiction and Story-induced Transportation to Story-induced Cognitive Empathy and Story-induced Affective Empathy. Control variables included in the analysis were Age, Exposure to Non-fiction, Trait Transportation, Trait Cognitive Empathy, and Trait Affective Empathy. Table 3 shows these results, with significant predictor variables highlighted in bold. Summary of multiple regression analysis indicating the contribution of candidate predictor variables to variations in Story-induced Cognitive Empathy and Story-induced Affective Empathy. Note: B = unstandardised coefficient; β = standardised coefficient. Key to abbreviations: EF = exposure to fiction; ENF = exposure to non-fiction; SIT = story-induced transportation; SIAE = story-induced affective empathy; SICE = story-induced cognitive empathy; TT = trait transportation; TCE = trait cognitive empathy; TAE = trait affective empathy. The first regression tested the unique contribution of the predictor variables to Story-induced Cognitive Empathy. None of the predictor variables were significant and the overall model failed to predict Story-induced Cognitive Empathy better than chance, F(8, 24) = .225, p = .983. RME performance was not predicted by Story-induced Transportation or by any of the trait empathy measures. Indeed none of the variables in the model had a p value of less than 0.3, suggesting that there was no association between any of the variables and RME performance. Although it was expected that RME would be an index of Story-induced Cognitive Empathy, performance on this task was unrelated to both prior reading experience and response to the specific reading task. The second regression tested the unique contribution of the predictor variables to Story-induced Affective Empathy. The model explained 24.9% (adjusted R2) of the variance in Story-induced Affective Empathy, and predicted Story-induced Affective Empathy at a level approaching significance, F(8,24) = 2.342, p = .053. The significant predictor variable in the model was Story-induced Transportation, with a standardised coefficient of .580 and a p value of .002. None of the measures of trait empathy predicted Story-induced Affective Empathy. The regression analysis also indicated that neither Exposure to Fiction nor Exposure to Non-fiction was a significant predictor of Story-induced Affective Empathy. It was hypothesised that Helping Tendencies would be predicted by Story-induced Affective Empathy. Helping Tendencies was treated as a binary categorical variable (further charity information requested/not requested). Logistic regression analysis was used to assess the contribution of predictor variables to Helping Tendencies. A summary of the analysis is shown in Table 4, with significant predictor variables highlighted in bold. Summary of logistic regression analysis indicating the contribution of candidate predictor variables to Helping Tendencies. The model predicted Helping Tendencies at a level significantly better then chance, χ2(9) = 20.388, p = .016. A significant predictor in the model was Story-induced Affective Empathy, with a standardised coefficient of 1.584 and a p value of 0.038. Story-induced Transportation was not a significant predictor of Helping Tendencies, although Trait Transportation was significant for this sample, with a standardised coefficient of 1.309 and a p value of .04. Neither Exposure to Fiction nor Exposure to Non-Fiction was a significant predictor of Helping Tendencies. The results of the present study support the existence of relationships between reading fiction and ‘real-world’ empathising abilities. Moreover, they indicate that two different types of empathy, cognitive and affective, have separate relationships with how much fiction an individual reads and how transported they are when reading a story. The amount of fiction that a person had previously been exposed to was positively associated with Trait Cognitive Empathy, after controlling for age and exposure to non-fiction texts. Conversely, those who had read more non-fiction tended to rate themselves less highly in terms of Trait Cognitive Empathy. The amount that participants had previously read, and what they had read (fiction or non-fiction), showed no association with their levels of Trait Transportation or Trait Affective Empathy. This suggests that the habit of reading fictional stories such as novels is related to Trait Cognitive Empathy but not specifically to other trait empathy components. Separate from the amount of fiction a person reads, transportation refers to how vividly a person imagines scenes and characters in a particular episode of story-reading (Gerrig, 1993). Transportation was found to be positively correlated with the extent to which participants reported feelings of affective empathy, such as warmth and compassion, while they read. Furthermore, analyses revealed that the relationship between Story-induced Transportation and Story-induced Affective Empathy was stronger than that between Trait Affective Empathy and Story-induced Affective Empathy. The correlational design of the study requires caution in concluding that there is a causal relationship between Story-induced Transportation and Story-induced Affective Empathy. However, this study does add to previous evidence (e.g. Johnson, 2012), which eliminated an alternative explanation that Trait Affective Empathy is the primary cause of Story-induced Affective Empathy. It also supports the findings of Bal and Veltkamp (2013) which state that transportation is an important component of fiction-reading if a reader is to change and become more emotionally empathic. This research also found that participants with higher levels of Story-induced Affective Empathy were more likely to demonstrate helping tendencies by indicating a desire to receive further information about a charity, as were those with higher Trait Transportation. Affective empathy in response to the story and helping behaviour were not predicted at a significant level by measures of Trait Ccognitive or Affective Empathy. They were also not predicted by the amount of fiction or non-fiction that had been read previously. Finally, neither previous exposure to fiction or non-fiction, nor the level of transportation in response to the story, predicted how well participants performed on the task requiring thoughts and feelings to be inferred from images of people’s eyes (the RME test). Participants responded equally well or poorly regardless of how much fiction or non-fiction they had read, their self-reported level of trait empathy, and how transported they had been by the story. These results will now be discussed in relation to previous research, and the implications of such findings described, with a focus on understanding the relationships between reading fiction and ‘real-world’ empathy. The results from the current study support theories suggesting that fictional stories require readers to understand the different points of view of narrators and protagonists, and that people who read a lot of fiction are therefore likely to have highly developed faculties of cognitive empathy (Zunshine, 2006). That exposure to fiction was positively associated with a self-report measure of cognitive empathy, but not with a self-report measure of affective empathy, is consistent with theory that written fiction can provide a deeper insight into the minds of characters than fiction in the form of plays or films (Lodge, 2002). Importantly, exposure to fiction was not significantly associated with trait transportation. A lifetime habit of reading fiction was found to be more indicative of the exercise of cognitive empathy in the real world than of empathy for fantasy characters as measured by the Interpersonal Reactivity Index. The relationship between fiction-reading and ‘real-world’ cognitive empathy found in the current study, adds to previous evidence (e.g. Mar et al., 2006; Mar et al., 2009) which suggests that engagement with the thoughts and feelings of characters in fictional stories might be closely related to the processes by which individuals infer the mental states of people in the real world. Future research could explore cognitive empathy and exposure to fictional stories in plays, films and TV programmes and test whether the relationship is weaker than the one that has been found between cognitive empathy and exposure to written stories. This finding would have interesting implications in terms of the potential benefits of delivering different formats of fiction exposure to children, and of developing and maintaining fiction-reading habits in adults. Contrary to previous research by Mar et al. (2006, 2009), the current study found no relationship between exposure to fiction and performance on the RME test. Mar et al. suggested that their findings were consistent with the RME being an indicator of cognitive empathy. However, although the RME has considerable face validity as a measure of social ability, there have been differing suggestions as to which component of empathy it actually measures. While Mar et al. (2006) suggested the task might be a measure of cognitive empathy, another recent study of fiction-reading and empathy (Kidd & Castano, 2013) utilised it as a measure of affective empathy. Given that there have been inconsistent results between this study and those previous with respect to the relationship between the RME and fiction-reading, some further lines of research are suggested. It would be useful to consider the relationship between reading fiction and a wider range of empathy-based tasks, including ones with cognitive components that do not include emotion recognition. It would also be interesting to include tasks that rely on purely verbal information as well as tasks, such as the RME, which use pictorial cues. It might be expected that readers of fiction will perform better on tasks with a higher verbal content, while those who experience fiction more through film or TV will perform better on tasks with a higher pictorial content. The results of the current study support previous findings (e.g. Johnson, 2012; Bal & Veltkamp, 2013), that the more people are transported by a story, the more affective empathy they experience while reading. The current study is correlational in design, meaning that the inference that transportation causes affective empathy cannot be made. However, alternative explanations, (e.g. that individual differences in trait transportation and trait affective empathy might cause differences in actual affective empathy while reading) were controlled by taking baseline measures of these variables. This strengthens the argument that an experience of being transported may play a causal role in inducing affective empathy. Trait affective empathy did not emerge as a strong predictor of story-induced empathy. These results appear to support a model whereby story-induced empathy is a feature of transportation, but is not strongly related to tendencies to feel affective empathy in the real-world. It is notable, however, that for the current sample the measure of trait affective empathy (the IRI-EC subscale) reported low reliability. Future studies could explore whether a sample with higher internal reliability for this measure would reveal a stronger relationship between Trait and Story-induced Affective Empathy, and how such a relationship might be mediated by transportation. A novel finding of the current study is that Story-induced Transportation was not associated with previous exposure to fiction, suggesting that even people who are not regular fiction readers can still be transported by a particular reading experience. Furthermore, transportation by this particular story was not significantly correlated with individual differences in Trait Transportation suggesting that even if a person is not typically prone to transportation, they can still experience it when reading a particular text. The results of the current study add to previous evidence (e.g. Johnson, 2012) that Story-induced Affective Empathy is associated with the demonstration of helping tendencies shortly after reading a story. A novel finding of the current study is that affective empathic response to a specific text is a stronger correlate of subsequent helping tendencies than life-time exposure to fiction. This research also indicates that Story-induced Transportation is associated with higher levels of affective empathy, which in turn is associated with the demonstration of helping tendencies. Johnson (2012), however, has suggested that transportation might also independently contribute to helping behaviours. It is possible that readers who are transported by a story that models helping behaviour might be more inclined to subsequently imitate such behaviours regardless of their level of Story-induced Affective Empathy. Although the current study also used a story that modelled helping behaviours, it is notable that Story-induced Transportation did not predict Helping Tendencies independently from Story-induced Affective Empathy. Interestingly, although Trait Transportation was not strongly correlated with Story-induced Transportation, Trait Transportation did predict helping tendencies at a level significantly better than chance. This result was unexpected and although it may simply relate to a type I error, future studies could examine how and to what extent Transportation (Trait and Story-induced) might directly relate to helping tendencies. It should also be noted that the current study builds on previous research by using a story with a very different setting. In the previous study (Johnson, 2012), the story location was familiar to the participants (a high school in the USA), while in the present study the setting was likely to be unfamiliar to participants (an orphanage in Botswana). Despite differences in familiarity, both stories generated affective empathy which in turn was associated with helping tendencies. Research has found that the more socially close two subjects are, the better able they are to share emotional states (Preston & de Waal, 2002). The findings of the present study however, suggest that transportation by fiction can enable the sharing of emotions even with characters who are socially distant from individuals, with a potentially positive impact on their real-world helping behaviours. A primary limitation of the current study is that it was correlational in design. Thus, it remains uncertain as to whether exposure to fiction develops and strengthens trait cognitive empathy, or whether people who are high in cognitive empathy are drawn to reading fiction because of the opportunities it offers to exercise their tendency to imagine the world as it appears to others. Equally, it is unclear if transportation causes affective empathy while reading a specific text, or alternatively whether the experience of feeling affective empathy plays a role in enabling the reader to feel transported. Finally, while it is possible that reading-induced affective empathy may play a role in inducing subsequent helping behaviour, it might alternatively be the case that individual differences in the underlying tendency to be helpful explain the variation in participants’ reports of feelings of transportation and affective empathy. If participants had guessed the hypothesis of the researcher and had an underlying tendency to be helpful, that in itself might account for the relationship between high affective empathy and helping tendencies. Caution is therefore required before extrapolating causational meaning from such findings. This limitation of a correlation design has been addressed in other studies by introducing a non-fiction reading control group (e.g. Bal & Veltkamp, 2013; Kidd & Castano, 2013). However, a further methodological question arises in respect to these studies, as to whether it is possible to directly compare the experience of reading fiction to that of reading non-fiction. Written texts vary from each other across many different categories and dimensions, of which the category of fictionality/non-fictionality is just one. Some dimensions such as word count can be easily controlled. Others such as subject matter, or emotional register however may be more difficult to operationalise. Some caution may therefore be required in inferring causal relationships from studies of fiction-reading that use experimental designs. Future studies must continue to recognise the inherent difficulties in concluding that reading fiction is the cause of changes in empathy. Moreover correlational designs will continue to be useful in identifying the relationships between the highly complex activity of fiction-reading and mental processes and behaviours. A further limitation of the current study was the difficulty in measuring how much fiction an individual has been previously exposed to. A potential drawback of the ART is that it might be an indirect measure of general educational attainment, rather than of fiction-reading habits. A well-educated individual might be aware of fiction authors without having actually read their works. However, the ART has been found to be a reliable and valid indicator of individual differences in exposure to print, and addresses the concern that participants might tend to give socially desirable responses if simply asked to estimate how much time they habitually spend reading (Stanovich & West, 1989). Furthermore, the inclusion of exposure to non-fiction as a control measure, meant that the effect of exposure to fiction was specifically identified over and above a general exposure to literature. The study was also limited to a relatively small sample size and in some cases (IRI-EC, IRI-PT and RME) the internal reliability of measures used was below the usual cut-off point for adequacy. While strong relationships were found between exposure to fiction and cognitive empathy, between transportation and affective empathy, and between affective empathy and helping-behaviour, replication of these results with a larger sample and greater internal reliability could provide greater confidence in the magnitude of these relationships. A final limitation of the current study is that participants were all volunteers who had given their time for no extrinsic reward. Therefore, it is possible that as a sample they displayed higher trait helping tendencies than the general population. Future research could compare these results with a non-volunteer sample who had been offered an extrinsic reward (e.g. a cash payment) for participating. Their baseline helping tendencies prior to reading the story could also be measured, in addition to completing the helping tendencies task. This study has added to a small but growing body of research that explores the relationships between reading fiction, empathy, and helping tendencies. Specifically, it indicates that reading fiction relates differently to cognitive and affective empathy. Life-time exposure to fictional texts is associated with the trait of cognitive empathy, whereas the immediate experience of being transported by a story is associated with affective empathy. Story-induced affective empathy in turn predicts immediate helping behaviour. Crucially, an individual’s habits and experiences of reading fictional stories have implications beyond the realms of ‘make-believe’ and fantasy. They are associated with how people understand the minds of those encountered in the real world, and motivation to help those in distress. These are compelling reasons why more attention should be paid to the enduring human fascination with fictional stories. Davis, M. H. (1980). A multidimensional approach to individual differences in empathy. JSAS Catalog of Selected Documents in Psychology 10: 85. Harris, P. L. (2000). Understanding Children’s Worlds: The Work of the Imagination. Oxford: Blackwell Publishing. Lodge, D. (2002). Consciousness and the Novel. Cambridge, MA: Harvard University Press. McCall Smith, A. (2001). Morality for Beautiful Girls. London: Little, Brown Book Group. Zunshine, L. (2006). Why We Read Fiction: Theory of Mind and the Novel. Columbus OH: Ohio State University Press.